This is the end goal: a stack of precisely-dimensioned parts. 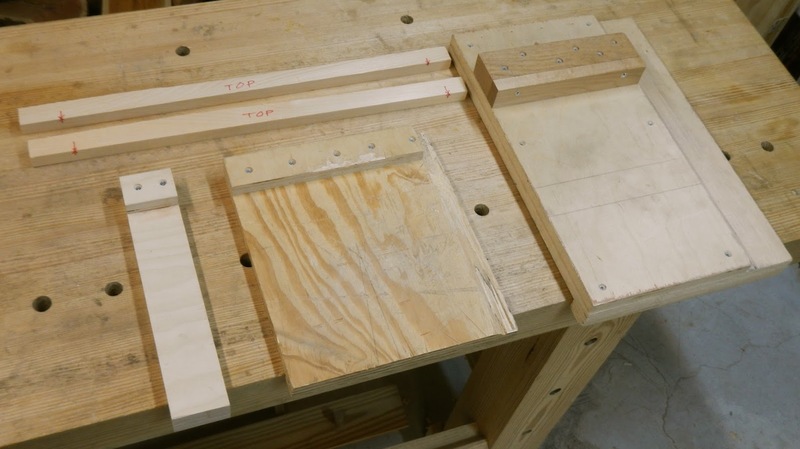 This post and its companion post on fine dimensioning originally appeared as a two-part series in the Guild Of New Hampshire Woodworker's Journal, Fall 2013 and Winter 2014. 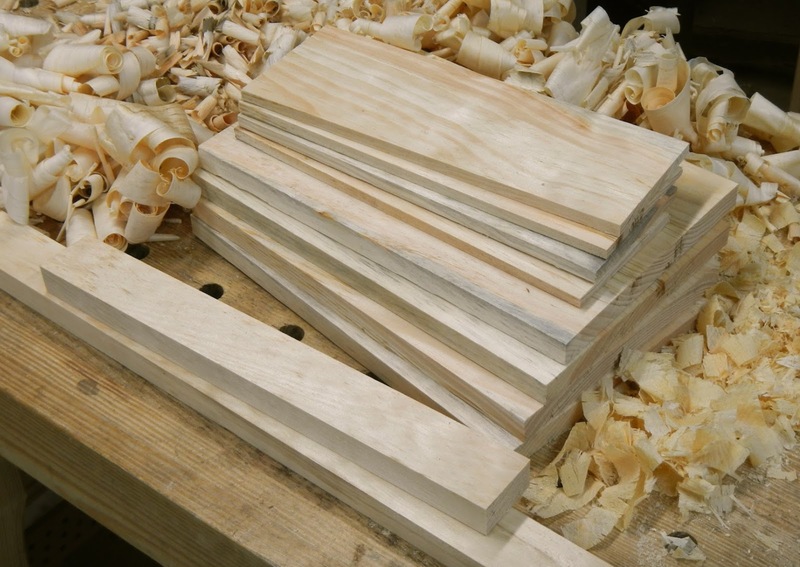 These are the skills required to turn raw lumber into precisely dimensioned parts using hand tools. When combined with hand-cut joinery, they allow you to turn any space into a workshop, no power required. It's a two-stage process: rough cutting and fine dimensioning, where handsaws and hand planes work as a team. Full size handsaws quickly break a board down to manageable pieces, without worrying about accuracy. Hand planes and smaller handsaws then bring them to final, accurate dimensions. You can pick the tolerance you work to based on your skill level. It doesn't take long to be working to the nearest 1/64 of an inch or tighter. 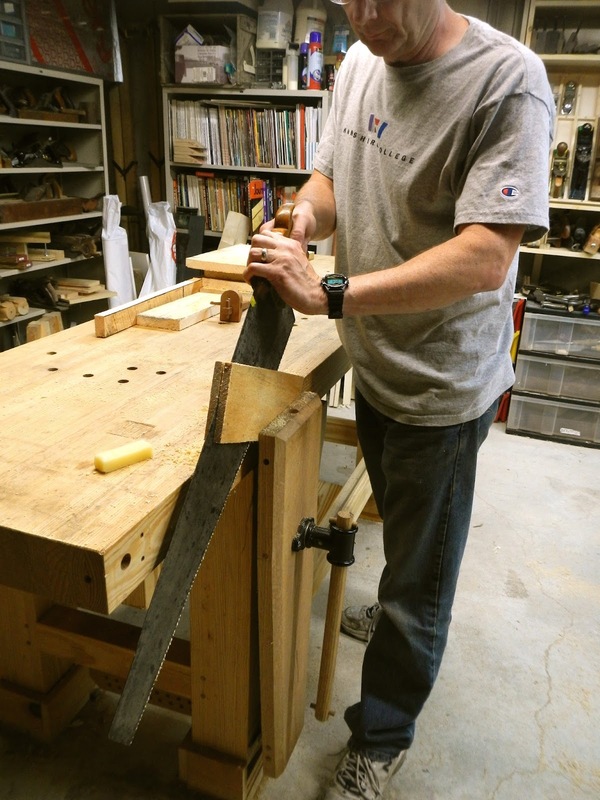 People tend to assume hand tools are crude, but they work to a fantastic degree of precision. And adjusting the fit of a piece is very easy; you can reduce any dimension by 1/1000 of an inch at a time with a plane. While I'm working with easy white pine here, the processes are the same for all woods, no matter how hard. Some just require more effort. No single step takes very long. Pace yourself and take breaks; slow and steady wins the race. Here I'll cover the tools and the first stage, breaking boards down. Then I'll cover the second stage, fine dimensioning. 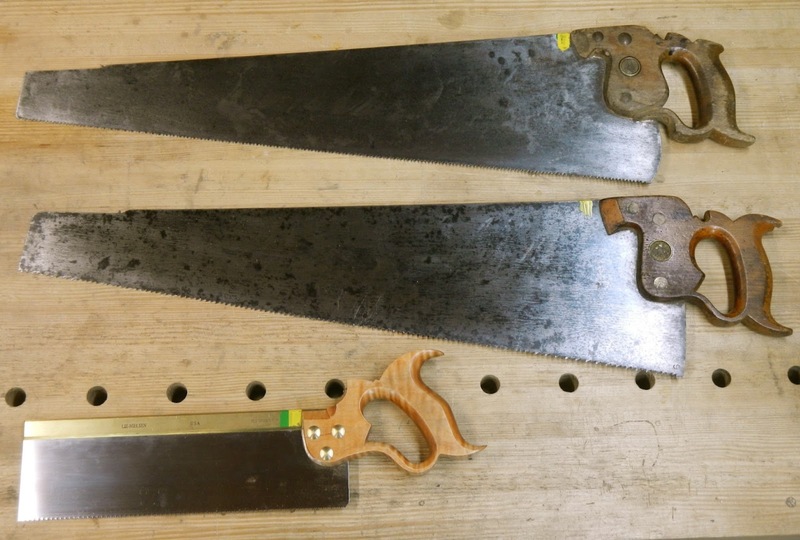 From top: full-size crosscut and rip saws, crosscut backsaw. From top: #7 jointer plane, #5 jack plane, #4 smoothing plane. From left: irons from the #7, #5, and #4 plane. The #5 is heavily cambered (curved) to allow taking deep chips for roughing. The #7 and #4 should either have their corners rounded off, or be very slightly cambered, to avoid digging plane tracks in the work when making overlapping passes. Clockwise from top left: winding sticks, shooting board, wide bench hook, and narrow bench hook. Sawbench. It's good to have two, so one can support the off-cut. You don't have to match this list exactly; variations can certainly get the job done. For instance you might have shorter panel saws (18"-24"), or do all your crosscutting without a backsaw. 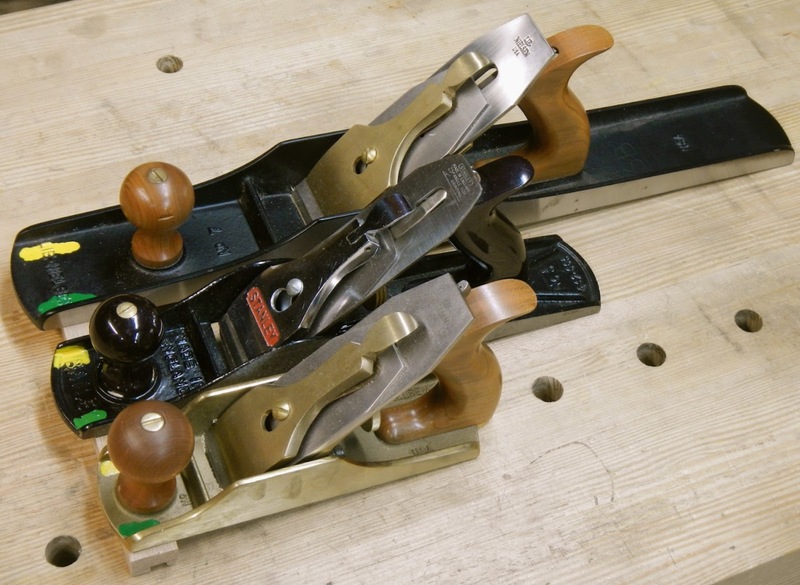 You might have a #8 jointer, or a #2 smoother, or prefer to do everything with a low-angle jack. There are two secrets to success. First and most obvious, the tools must be sharp. 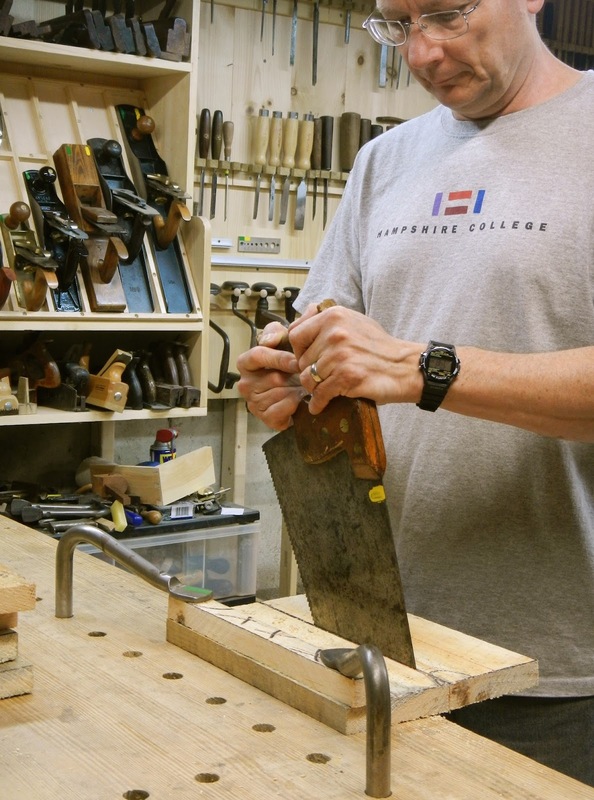 Learn how to sharpen your own saws and planes. Second, lubricate the bearing surfaces as you work. Apply a scribble of wax or a light wipe of oil periodically to the saw sides and plane beds. For wax, use beeswax or paraffin blocks, paste wax on a rag, or even the edge of a candle. For oil, use a moistened rag or wipe the tools across an oil wick (a rolled up rag in a can or jar, the exposed end moistened with oil). Some people use boiled linseed oil, but that poses the risk of spontaneous combustion in used rags, so others prefer a light machine oil. Sharp tools that move smoothly are a joy to use. Rip and crosscut saws are almost identical. The difference is in the way the teeth are filed and the resulting cutting action. They're measured in points per inch (ppi); small number means large teeth for faster cut, large number means small teeth for finer cut. Note that I'm talking about Western style push saws here; Japanese pull saws have similar concepts, but different details. Rip teeth are filed straight across, with an almost vertical leading edge. They act like tiny chisels cutting with the grain, chiseling out tiny chunks between the fibers of the wood. Only the forward stroke cuts. Crosscut teeth are filed at opposing angles on two faces, with a raked back leading edge. They act like tiny single-edge knives cutting across the grain, severing the fibers of the wood. Both the forward and back strokes cut. Both types have set to the teeth, meaning alternating teeth are bent slightly outward. This adds enough width to the kerf to clear sawdust and keep the saw from binding. Learn to recognize the difference by sight. It's instructive to deliberately use the wrong saw for the wrong cut to see how differently they behave. Using a full-size ripsaw to crosscut jams up almost immediately as the teeth catch across the fibers; forcing it just results in an ugly tearing cut. Using a crosscut saw to rip goes a little better, but soon binds in the cut. If a saw suddenly seems to be doing a terrible job, you probably picked up the wrong one by mistake. As you get to really small teeth in joinery saws, 12ppi or finer, a ripsaw is able to crosscut more effectively, so may be able to do double duty. A plane's function is dictated by its length, and its order of use is dictated by its function. The longer a plane is, the more it rides across the high spots and shaves them down to an even surface. The shorter it is, the more it follows the existing contours of the surface. 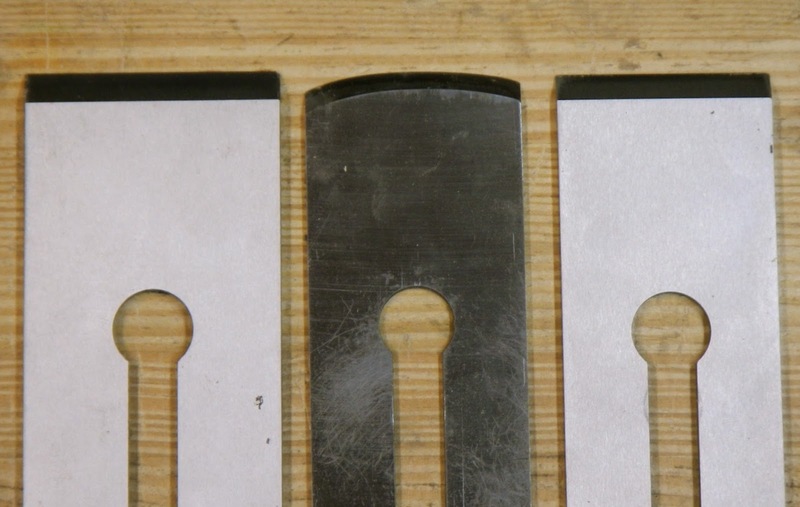 So longer planes are more suited to flattening, while shorter planes are more suited to fine smoothing without significantly changing the flatness. I use medium length planes for stock removal. The order of operations is stock removal, followed by flattening, followed by smoothing to final surface, so the order of use is medium plane (jack), long plane (jointer), and short plane (smoother). Stock removal means removing wood fast, without worrying about appearance. The medium plane with cambered iron is very effective for this. The cambering (curved profile) allows you to set it for an aggressive cut, taking thick chips that feather off on the sides. You can take an edge down by 1/4" or a surface down by 1/8" in seconds this way. The resulting surface is rough and deeply scalloped. The long plane quickly flattens it. The first few passes just nip off the high spots, but subsequent passes begin to take off full shavings. Once the surface is flat, the short plane set very fine gives it a final satiny surface. For both flattening and smoothing planes, round the corners of the irons so they don't dig in and leave plane tracks in the wood as you make overlapping passes, or camber them very slightly. The depth of cut on each plane is like a manual gear shift on a car. Don't just set it once and forget it. Adjust it continuously to take heavier or lighter shavings as needed. Clean and oil the threaded adjuster so you can change it with a rolling flick of the thumb or finger. The chips from the medium plane will be 5-20 times the thickness of the shavings of the long plane, which will be 2-5 times the thickness of the shavings from the short plane. For speed and efficiency, use whichever tools takes the biggest bite without going past the line you're working to, then switch to the finer tool to clean up. Rough-milled pine board marked out for rough parts, avoiding knots. Break a board down to rough parts in two stages. First deal with the big pieces on the saw bench or sawhorses. Then deal with the smaller pieces at the workbench, using the bench hooks or the vise. Lay out your cut lines on the board with chalk or a lumber crayon. Plan the rips and crosscuts to get the most out of your board, working around any defects like knots or splits. Allow some extra margin in each dimension, since these are rough cuts that will need to be cleaned up with the planes. Reasonable total margins are 1/2" to 1" in length, 1/8" to 1/2" in width. The fine dimensioning steps will deal with these easily. Smaller margin means less to remove in the finer stages of work, while larger margin gives you more leeway to deal with problems. Work to a margin appropriate to your skill level. As your skill improves, you can bring it in tighter. I generally err on the larger side; you're going to be trimming off some excess in the fine dimensioning no matter what. The worst thing you can do is have to scrap a piece because you cut too tight and didn't leave enough margin to plane it smooth. Controlling a saw of any size is a matter of maintaing alignment with your body. Your body position and the multiple joints of your arm all affect it. Stand to the side of the cut to provide clearance for your arm to move back and forth. Your wrist and the toe of the saw (the far end) should move back and forth on a straight line with your shoulder, keeping your elbow in the same plane. 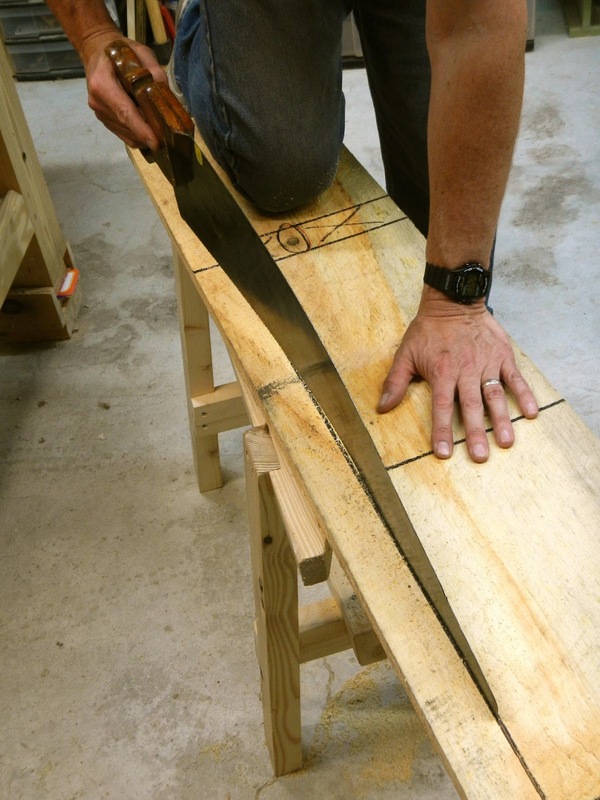 Kicking your elbow out or hugging it in, or trying to hold the saw at some off angle, will throw the cut off. Sight down across the back of the saw to line it up to the cut, plumb and aligned. This is similar to sighting down a rifle or bow and arrow to aim it. Use the full length of the saw in steady strokes and allow gravity and the teeth to do their work. You don't need a lot of down force on it. Grip the saw with three fingers, extending your index finger along the handle. This "trigger finger" grip gives you better control, which will become more important when doing precision joinery sawing. You'll notice that your hand fits better, too; saw and plane handles are actually sized for this grip, not for a full hand. 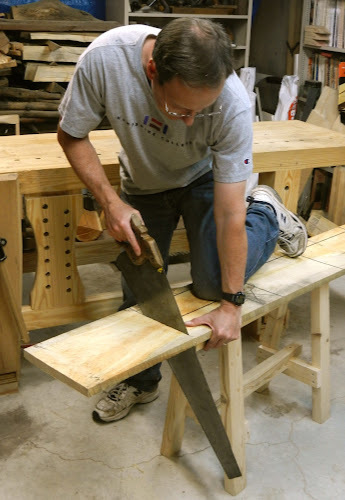 Hold the board down on the sawbench with your knee. Note the index finger extended along the saw. 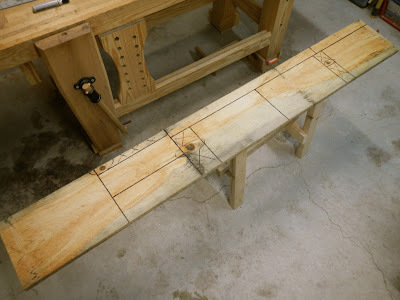 Unless you need to rip down the entire length of a board, start out with crosscuts to break the big awkward piece down to manageable size, using the crosscut saw. Lay the board on the sawbench with the cut line just past the end and kneel on it with a leg to hold it down. 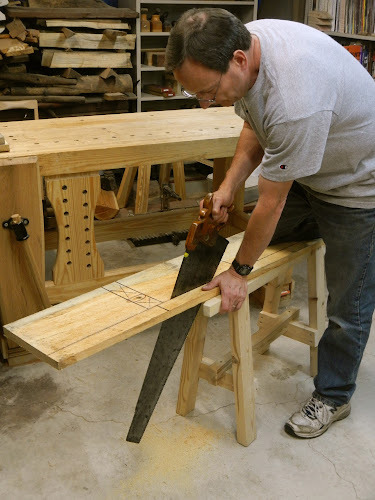 If the offcut will be long, it helps to have another sawbench or pair of sawhorses to catch it. Since I'm right handed, I kneel with my left leg. That provides clearance on my sawing side so I don't get in my own way. With the saw plumb and aligned to the cut, pinch your fingers on the edge of the board at the line to act as a guide and use a nibbling action back and forth to start the kerf. Then clamp the board down to the bench with your hand and saw at about a 45 degree angle. As you reach the end of the cut, grasp the offcut and raise the saw angle for a light, clean finish. The main thing to avoid is having the piece fall and tear a big splinter off. Remember this is rough cutting, so perfection of cut is not your goal. You just want to separate the pieces. Ragged cuts, off alignment, out of plumb can all be corrected as long as you stay within your margin. When ripping, slide the board forward as you progress. Ripping with a rip saw is much like crosscutting, except that you need to slide the board forward as you progress through the cut. I hold it down it with my right knee so I have clearance on my right side. Again, an additional support helps as more and more length hangs over the sawbench. Hold the saw plumb and aligned to the cut. Pinch your thumb and finger over the edge at the end of the board to act as a guide, and use a nibbling action to start the cut. Saw steadily at about 45 degrees. The two main differences from crosscutting are in maintaining the cut and completing it. Crosscuts are usually short enough that they don't get too far out of alignment, but long rips can start to wander. The trick is to steer the saw like you steer a car. As you drive, you don't hold the steering wheel dead in one position, you constantly adjust it to the road and the tracking of the car. Even going straight, you steer a little left, a little right to maintain direction. The spring steel of a good ripsaw lets you to do the same thing. This allows you to rip a 1" strip off an 8' long board. If the cut starts to wander, drop the angle of the saw and pull it to the side, flexing it back toward the line as you continue sawing. Once it's back on track, straighten it back out and resume sawing at the normal angle. If you overcorrect, just steer it back the other way. Lower the angle of the saw and flex it to one side or the other to steer it back to the line. This kind of correction leaves humps and dips in the cut edge, but they clean up quickly with the long plane (remember its function is to flatten, or in this case, straighten). This is why you leave yourself some margin commensurate with your skill. Need a lot of correction? Leave a lot of margin. Even the ugliest cut will clean up quickly with the medium plane set for an aggressive cut. To finish, reverse the board to the other end and cut from there until the two cuts meet somewhere around the middle. If the first cut starts to go really bad, you can switch to the other end sooner as a major correction. For thick stock, mark the cut line on both faces of the board, and repeatedly flip the board to the opposite face as you progress. This allows you to correct for the saw being out of plumb or the thickness taking the underside of the cut off course as the saw flexes. Hold small pieces upright in the vise for ripping. Once you've broken the board down to pieces too small to work on the sawbench, do the rest of the sawing at the bench. To rip small pieces, hold the work upright in the vise. Saw as before, flip the piece over to cut from the other end, and meet in the middle. I like to drop to one knee to get a good angle, but you can also do it standing upright. 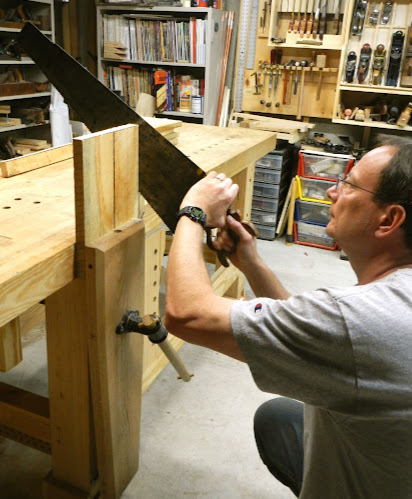 An alternate work-holding method is to clamp the piece along the front edge of the benchtop, then saw with a double-handed upright stance or from the side. 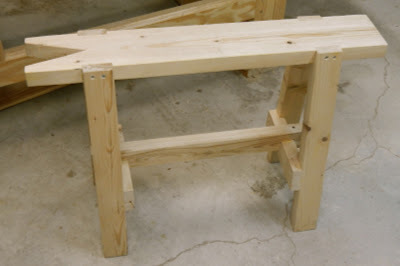 This also works for long rips if you find leaning over the sawbench hurts your back. You can even do crosscutting this way. Sawing along the edge of the bench with an upright stance. Crosscut small pieces on a pair of bench hooks. 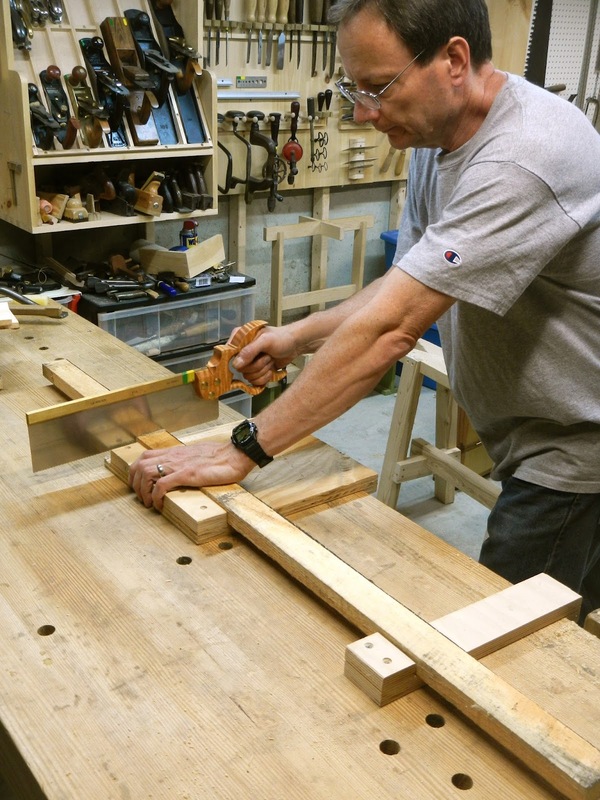 To crosscut small pieces, hold the work on a pair of bench hooks. Spread them apart to give better support. The front of the hook catches the front of the workbench, and the back catches the workpiece. Lean into the piece with your free hand to hold it in place. Use the backsaw, since this is smaller and lighter work. But don't worry about accuracy yet, because this is still rough cutting. Resawing a piece for thin stock. When you need thin parts, such as drawer sides or dividers, rather than wasting enormous amounts of material by planing down to the desired thickness, resaw your stock. Resawing is ripping across the width rather than across the thickness. It's the most laborious operation you'll do, so get the pieces down as small as possible first, to rough length and width. Then the work is manageable. Allow plenty of margin, because you'll end up with rough surfaces that will need to be planed down. The saw can also bow inside the cut if you try to saw too aggressively, creating a thin spot in one side and a thick spot in the other, all requiring more planing down to flat. As you get good at it, you'll be able to resaw the resawn parts even thinner. Scribe a line at the desired thickness (plus margin) all the way around the workpiece. Secure it in the vise with a corner sticking up. Start ripping at the this corner just like a normal rip. The key here is to align the saw to the cut on both the edge and end grain. Sight down over the back of the saw to the teeth and align them to the two scribed lines. Alternately drop the angle of the saw to extend the cut along the top edge and then raise it to go down the end grain. Keep a close eye on it, especially where the far teeth exit the cut. If it's going well, you can keep doing this until the cut reaches all the way across the end grain to the adjacent corner, or you can flip the piece over to start anew from that corner, and have the two corner cuts meet. From there, repeatedly flip the piece and cut a little more, flip and cut. This allows you to keep it under control and correct for any wander quickly. It also reduces the effort required to cut. Each time you flip the piece, you start cutting the tip of the triangle formed by the previous diagonal cut, so it's much easier than sawing the full length of the diagonal. Once you get near the end, you can drop the saw down and go along the edge to connect the near corner, or simply start fresh from these corners. Either way, reverse the board to work on the other end, and everything meets somewhere roughly in the middle. Each of the four corners allows you to get a fresh start on the cut if it starts to go bad. Light pressure and frequent flipping give the best results, as well as frequent lubrication. For more photos and video of resawing, see resawing by hand. None of the steps here are particularly difficult. Working one piece at a time, you can pace yourself to complete a whole stack of parts. Getting the fine control down is a matter of practice. It's worth investing in a couple boards just to practice breaking them down and dimensioning them, without worrying about a specific project. Another epic post Steve. You certainly provide a lot of detail and new woodworkers should really appreciate the care you take. I've followed you for a very long time and I don't recall seeing you explaining the green and yellow markings on your planes. Hmmm? ???? Thanks, Bob! Yeah, that's the way I used to mark my climbing gear. I needed a high-visibility mark that would show up in the dirt and leaves, and I had these rolls of colored electrical tape. I started marking my tools with the tape when I took a carving class, and I knew everyone was going to have pretty much identical tools. A couple people set theirs down on a bench, and you can't tell whose is whose. I got matching paint for marking planes. It was only later I noticed they were the John Deere colors!